I hate frying; and I’m sure I’m not alone when I say that I avoid frying like the plague. Don’t get me wrong, I can always enjoy a hearty batch of chicken wings or a few fried calamari, just not in my (tidy) kitchen. Whenever I do fry, which is rare, I make sure that it’s something completely worth the extra calories and additional cleanup at the end. These croquettes, my friends, are worth it – worth every single drop of splattering oil and all the calories in the world. 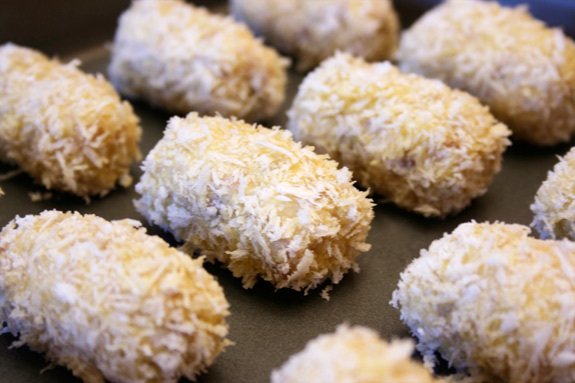 If you haven’t had croquettes before, you’re in for a treat. They’re basically tiny nuggets of overly thick béchamel sauce that have been breaded and fried (pause: how can this not taste good?). Given its name, it seems as though the origin of this ingenious creation is French (surprise, surprise); but today they’re most commonly associated with Spanish tapas. Yep, the Spanish rock these bite sized treats usually with jamón serrano or chicken (or both, thanks Núria). Of course, I opted to blog about the ones made with jamón serrano (i.e. the pork variation). filling update (09/14): You can also try tuna or spinach, thanks Nikki; or even use up all your leftovers, thanks Joey! For some extra ham flavor, just boil your milk with a jam bone and strain it before you want to use it, thanks Núria. Jamón serrano is essentially Spain’s version of prosciutto. 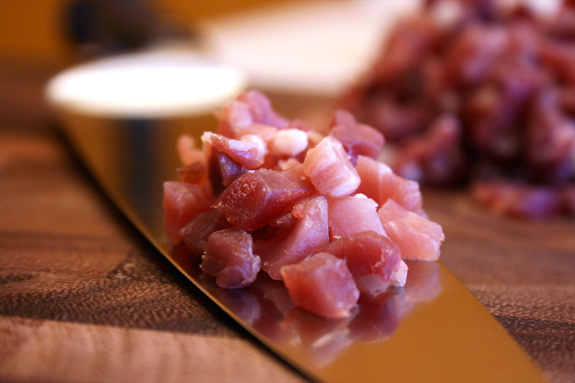 It’s actually one of the many varieties of cured hams native to Spain and the one most commonly used for making croquettes. If your supermarket doesn’t carry jamón serrano, you could always use prosciutto or swap out the ham entirely for some chicken. Be careful though not to confuse jamón serrano with jamón ibérico, which is Spain’s most prized variety of cured ham that runs between $52 and $96 a pound! These are the croquettes (breaded and ready to go into the hot oil). I coated mine with panko bread crumbs, which are Japanese style bread crumbs that I happened to have on hand. If you’re strictly going for an authentic taste and texture you should use regular bread crumbs; but either work just fine. This is the moment that makes the entire process completely worth it. After frying, the creamy inside becomes incased in a crispy, golden brown layer of fried deliciousness. If there’s any pearl of wisdom I can pass on to the readers of this post, it would be: beware of the extremely hot filling. It’s too embarrassing to admit how many times I’ve burnt my tongue trying to sneak a bite of these straight from the hot oil, but let’s just say I learned my lesson the hard way (multiple times). 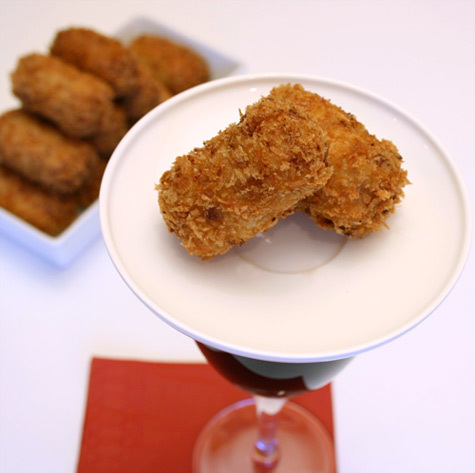 Like most tapas, croquettes are meant to be enjoyed with a glass of wine, in good company and in small portions (that’s the key to getting away with eating such decadent foods). If you’re craving some food trivia: the word tapas comes from the Spanish verb, tapar, which means to cover. Since tapas were traditionally served with a sweet wine at Spanish bars, people needed a way to keep flies from flying into their goblets. So bar owners started serving these small dishes called tapas for people to cover their drinks while having something to munch on – genius and definitely worth frying for! Heat up the milk on the stove or in the microwave. In a medium saucepan, melt the butter. Add the diced onion and sweat for 3-5 minutes (i.e cook over medium low heat so that the onion remains translucent). Add the jamón serrano and flour and cook for a couple minutes until the dough turns a golden brown color. Gradually add the milk, making sure to stir constantly. Cook until you get a very thick dough that comes away from the pan. Cover and refrigerate for a few hours (preferably overnight). Form the croquettes. Bread them by coating them in flour, then egg, then rolling them in the bread crumbs. notes: You could freeze them before frying to fry at a later time. Or you could also fry lots of them, freeze them and bring them up to temperature in a 450 degree oven for 10 minutes. Posted in appetizers, French, recipe, savory, Spanish by Antonio Tahhan on September 9th, 2008. You can follow any responses to this entry through the RSS 2.0 feed. You can leave a response, or trackback from your own site. bacon, fried, coated – you really got me going here tony! this is fab! The result of these fried Jamons is fab…worth the trouble and sizzling burns from the oil. What are you waiting for…FEED ME! Love croquetas! The ones with jamon serrano are definitely my favorite, although my mom went through a period when she tried to turn all our leftovers into croquetas! The close up of the chopped jamon serrano made my tummy jump! These look so delicious! I don’t fry often either because I hate the mess, these look worth it though! I don’t think I would learn that lesson very quickly. These little bites are too irresistible! My IKEA grater is famous ::swoons:: Thankfully you didn’t take too long to fry, I almost ran out of air freshener for my room! These look amazing. Will you come make them for me? They’re way beyond my grade level. You and me both, Tony. Frying is an epic pain if you don’t have anywhere to store the oil. I would like to get a deep-fryer, but then I’d be frying more than I am now (which is next-to-none) and I’d have to log more miles, heh. These sound incredible, and it looks prefect. Oh Lord your croquetas look FABULOUS! I usually make tuna ones (also worth frying for! lol), but you can pretty much use any filling you want (spinach is awesome). I love the use of panko, too! Extra crispy! Riquísimas! Seriously, how good do these look??! And how did you get them to be so uniform? That is a cracking photo! First of all, thanks for commenting on my blog! And second… what a site you have here!!!! Awesome! I love it :D.
Wow, these are absolutely to die for! Two-bite morsels of absolute perfection. Oh, MY GOD. I just found your website and I seriously read this and gulped. My mouth is watering and I think I love you. This blog is a work of art. Your love of food is admirable. I can’t wait to keep up with your works of art! Peter – hahahaha! First off, welcome back! I’ve been enjoying all your Greece posts … although I’m slightly jealous 🙂 I can’t keep track anymore – half my friends call me Tony and the other calls me Antonio and so I gave up trying to stick to one, haha. I’m just now recovering from the burns, but you’re absolutely right, they are worth it! HoneyB – Thanks! I think it helps to anticipate the (slight) mess… that’s what I did and so I feel like I was prepared. Nate – I’m scared for the next time I make these, haha! Raquel – haha, I forgot to turn on the vent on top of the oven… sorry : ) your grater is on its way to stardom! Karen – Of course I will make these for you. When will you come visit?! Christina – I also don’t fry that often to make a deep-fryer practical. To help make the whole epic frying event worth it, I made a double batch of these and froze half of them already fried up. That way all I have to do is heat them up under the broiler whenever I want more… You loose some crispiness, but it’s something I can live with! Nikki – Gracias!! I was hoping you’d like them : ) Thanks for the info about alternate fillings (I will be updating the post). Kittie – Thanks!! The key is just to have a very well chilled dough 🙂 Then these babies will form themselves! Núria – Oh, the ham bone idea sounds fantastic!! I actually told my (Middle Eastern) grandmother about it today since she also loves making croquetas, but with chicken. Combining the two is something I also have to try ASAP! This lookt truly amazing! I don`t think I can imagine anything that I would like to eat more than that right now 🙂 also, great pictures! Hi, Tony. I’ve been meaning to come back and visit you since before the DB challenge. Your blog is so beautiful. And so is your food. So, the frying thing? I try not to fry as much as possible, but it’s a necessary evil in the South. My kitchen is tiny and I try to prevent mess at every turn. I think I’ve perfected it for me. And I always use a stock pot. Such a beautiful croquettes! I do too not fond of frying in my tiny kitchen. But indeed there are certain food that only good when fried and well worth the effort. definitely worth frying tony ! only i’ll make it in chicken 🙂 no pork for me. Tony, you are right on every count. I don’t fry often either. These were work. And sooooo yummy. Thank you so much! Hi Tony, I usually only fry donuts. But I would love to taste those. Well done on this one. Hi Tony, here’s link to Mark Bittman’s blog. Bitten. 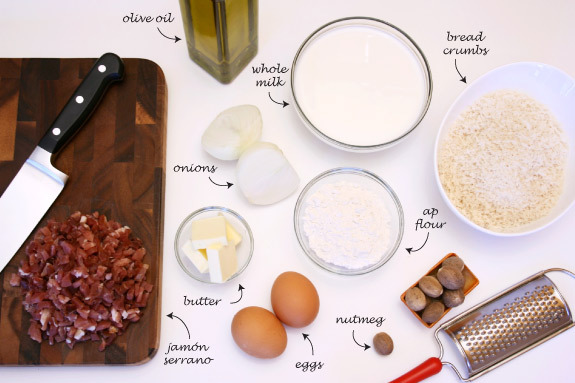 I linked your recipe. Scroll down. oh my goodness, i am totally w you when you talk about avoiding frying. i almost never ever ever fry these days, unless it’s absolutely vital!! i dont like frying for health reasons, for smell reasons ( hate it when the kitchen and my clothes smell like fried food!!) and bc i feel it usually covers up the food’s taste also. 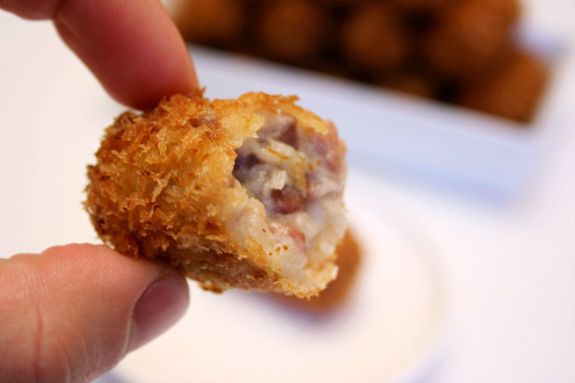 but for these croquetas, you are right, it is maybe worth frying for…! ¡Oye Antonio! Keefak? And how’s your grandma? I realize that this is a super old post, but I felt the need to comment on it anyway. I just wanted to say, these are INCREDIBLY different from the Cuban croquetas de jamón my grandma makes. Those have a mixture of ground ham and mashed potatoes mixed together, and she coats them in cracker meal (not bread crumb). But your look interesting – the panko is a nice touch. Creative. Have to try that sometime!